Here are some great ideas for crafts made from recycled items. 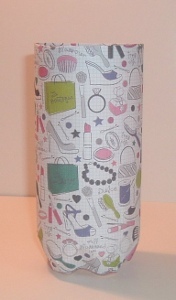 Use these instructions to make a Water Bottle Supply Organizer Recycled Craft. 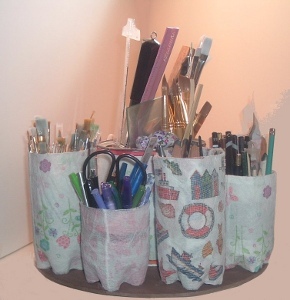 This is an easy way to organize your crafting supplies with water bottles and other recycled items. 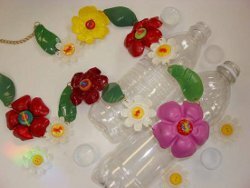 Water bottle crafts are a fun way to reuse materials you already have and try new kind of projects at the same time. Often, water bottle crafts are appropriate for all ages, so gather up the kids and have them help you finish this project. If you keep losing pens or other office supplies, this is a great way to get organized. Who knows, you might actually want to sit down and get work done when you have your desk all neat and organized. Remove the labels from coffee can and bottles. Wash the can and bottles and allow to dry. Mix some of the paint with enough water to make it the consistency of stain, about 2 parts paint to 3 parts water, and brush onto the best side of the luan wood and allow to dry. Two coats will be good. I used paint to stain the wood only because I don’t like the smell of stain. Decide how tall you would like your bottles to be. I used several heights (6-1/2”, 5”, 4-1/2” and 2-1/2”) that worked well for storing paint brushes, pencils, pens and even a very short one for erasers, rubber bands, etc. Set the bottles on a flat surface and, using a ruler, mark the height that you want each bottle to be. I made several marks, with a permanent marker, around each bottle and ‘connected the dots’ for easy cutting. No alterations will be made to the coffee can. Use the X-acto knife to pierce the bottle and to make a slit above the line you drew, that you can use to start cutting with your scissors. Cut along the line you drew to remove the top of the bottle and throw away the excess plastic. Measure your chosen paper from the very bottom of the bottle to ½” above the cut edge. The extra half inch will be folded over and glued to the inside for a nice finished look. Add an extra ¼” or so to the width so the paper will overlap. When you’ve cut your bottles to the desired size, and measured your paper to fit, coat them, one at a time, with a thick layer of white glue. I used Elmers, but I think Tacky Glue would be as good. Do the same with the coffee can. Lay the paper that you’ve cut face down on a flat surface and position the bottle’s bottom edge at the edge of the paper and roll until the paper completely covers the bottles and can. Add a stripe of glue to the edge and press the extra ¼” of the width down to make a neat seam. Do the same with the coffee can. Press the bottom of the paper into the little indentations around the bottom of the bottle. When all of the bottles and the can are covered, allow them to dry completely. When the bottles and the can are all dry, cut pieces of cheese cloth to fit each bottle, adding ½” to the top and bottom of the height. So the cheese cloth will be 1” longer than the paper that you cut. Again coat the bottles with glue. You don’t need a very heavy coat this time, because cheese cloth won’t absorb the glue. Fold the bottom of the cheese cloth ½” (you may want to use a glue stick to keep the ½” fold in place) and, again, roll the bottle onto the cheese cloth and press in on the indentations at the bottom of each bottle. Glue the inside of the bottle ½” from the top and fold the top ½” of cheese cloth inside the bottle. Cut cheese cloth 1” longer than the area between the top and bottom edges and about ¼” wider than needed for overlap. You won’t have to fold the top ½” over the top edge, but you will want to fold both the top and bottom edges of the cheese cloth to make a neat edge. Allow the bottles and the can to dry completely. Find and mark the exact center of the lazy susan, the coffee can and the wooden disc. Drill through all 3 pieces at the center mark you made on each. Using a ¾” metal screw, and a washer, attach the 3 pieces, turn the project over and using a nut, tighten it down. Make sure the lazy susan still spins freely. Position your bottles close to the outer edge of the wooden disc. Drill a hole through each bottle and another hole through the wooden disc where each bottle will be placed. Put a washer on each screw and insert it through the hole in the bottle and the hole in the disc. Turn the project over and with another washer and a nut, tighten each bottle. When all of the bottles are attached, your supply spinner is ready to use. You'll be amazed to find out how many awesome crafts you can make out of recycled plastic bottles. For inspiration and ideas, check out this collection of 14 Easy to Make Water Bottle Crafts. These plastic bottle crafts are creative, unexpected and so fun to make. If you love creating your own jewelry or want to make beautiful home decor items, you'll love this collection of recycled craft ideas. The next time you enjoy a cold drink of water, rest assured that the empty plastic bottle won't go to waste. Environmentally-friendly ideas have never been more fun or exciting. This is a great DIY project. I was gathering up my materials when the idea of what to use it for came to me. I am a crochet nut. So my crochet hooks can go in some of the bottles. I can even write the sizes on the bottles. Plus pins, picks, etc. I love this upcycled project! It is the perfect thing to get done on this long weekend! There are so many options to choose from for how you want your bottles to look. I first thought of my son and all his pencils and other writing utensils that he has lying around. He would love this, but Im not sure he would keep the items in there! The cheesecloth does give it a nice texture! I could see using fabric to cover these also, and perhaps even a decoupage type product would work well with these. They really look nice and could even be further embellished depending on how busy your pattern is to begin with. Good practical,project! I love to upcycle things so nuch that i have a cabinet full of glass and plastic containers that I can't stand to part with. This is a simple idea for storage and it would also be great organizer for my daughter's desk. It could help prevent a lot of lost pens and pencils. Thank you for the idea. Could someone tell me what the cheesecloth is for? I hot-glued a plastic coffee can in the middle, and then the water bottle bottoms around it, so there were no holes to let water out, and let my daughter use it for her water-color paints. The can in the middle can be used for clean water between colors, and the bottle bottoms keep the paint from splashing and spotting stuff while the brushes are dipped and swished in them. I've been re-purposing soda bottles of all sizes, as well as Folder's coffee containers, for years! I've also re-purposed the gallon size containers that Kraft Mayo & Miracle Whip came in a few years back, into an adorable Canister Set! The smaller quart of so sized Mayo containers the ones that are sort of oval-ish shaped? I use those for organising my "JUNK" bin, as well as using them for my previously mountain sized pile of plastic canvas odds, and embroidery thread, as well as they make lovely containers for all those odd screws & nails, that some of us just can't part with! Oh, and another great use for 2 liter or larger Soda Bottles is to add embellishments, and make then into Piggy Banks for the young'ens too! All you need is IMAGINATION!! How sweetly upcycled & perfect! What is the use of the cheese cloth? This is way cute, I t would be just perfect for a childs desk, or a home office. I absolutely love this project, i am saving wallpaper scraps and bottles to make my own! love it, a good use for plastic bottles. You need to use bolts washers & nuts, not screws. I think it is a very good idea and will start saving bottles, and ask my neighbor for a coffee can. Thank you for a great idea. Not only can I recycle but it is cute and very useful. I am saving my bottles up now and getting other needed supplies in the meantime. This will be the perfect addition to my craft table. At last I will have the right spot for all those craft items. I really like this idea.I am seeing really cute and useful gifts for my famikly and friends. Thanks for another great idea. Great idea--I am ALWAYS looking for good storage ideas-thanks!